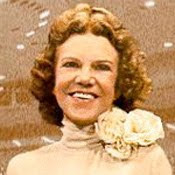 Kathryn Kuhlman attracted enormous audiences by the 1960's. Her books I Believe in Miracles and God Can Do It Again became best-sellers. The daughter of a Methodist mother and a Baptist father, she felt called to preach at the age of sixteen. "I went from community to community, sometimes having to hitchhike. I would find an empty building, advertise the service, set up benches and people would come—strictly out of curiosity to see a red-headed, teenage girl preach." She was ordained by the Evangelical Church Alliance . Kathryn was repulsed by the usual tent healing services which were the mark of the early healing revival. "The long healing lines, filling out those cards, it was an insult to your intelligence," she said. Her style was very theatrical, but there was no fanaticism in her services. "Often there is such quietness that the faintest rustle of paper may be heard." . Miss Kuhlman had obviously learned from some of the mistakes in the healing revival and sought to minister healing through more acceptable means. Miss Kuhlman constantly talked of the enormous sense of responsibility that she felt. She would cry while on the stage, "The responsibility, the responsibility. I cry for those who won't be cured today. I ask, am I at fault? Oh the burden of it all." At this point she buried her face in her hands sobbing. But then she recovered, "Is it worth it, oh Lord? Yes it is. It's worth the price when you see one case of cancer healed, one child made better!" Her experience was typical of the experience of many healing ministers. It certainly appears there's a price to pay to minister in this area. Her method of ministering healing was as follows: She would be given very clear "words of knowledge" concerning the physical condition of people in the audience. She would call these out and many would be instantly healed. She would often describe personal histories accurately and even call out their names. Major miracles took place in her ministry: the healing of cancer, paralysis, polio victims, blind and deaf. Related only marginally to the healing revival of post World War II, Kathryn Kuhlman had become one of the most respected leaders of the charismatic revival by 1970. She had come to a healing ministry in her own way, and had established a reputation of integrity and intellectual honesty greatly prized by neo-Pentecostal leaders . During the 1970's, Kathryn Kuhlman was on the forefront of the healing ministry. When she died, she left behind a credible witness, and a ministry from which others could learn and develop in the ministry of healing. David Edwin Harrell, All Things Are Possible : The Healing & Charismatic Revivals in Modern America (Bloomington: Indiana University Press, 1975), 190 - 191.